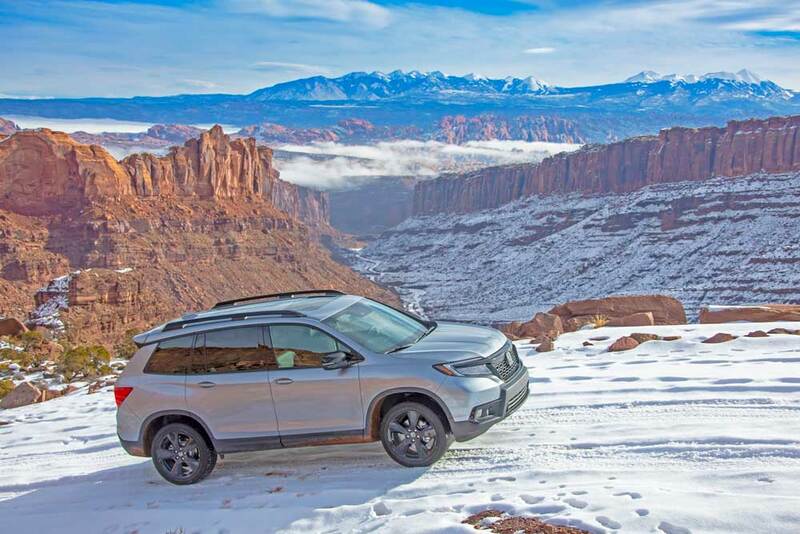 Moab, Utah – The Honda Passport for 2019 is an all-new, two-row, five-passenger SUV that fits nIcely between the compact Honda CR-V and their three-row Pilot SUV. It delivers a combination of refined on-road driving and off-road adventure capability along with ideal occupant safety and comfort as well as best-in-class interior space for passengers and cargo hauling capacity. The Passport lineup is based on a reinforced unibody frame. There are four levels of trim, with progressive equipment upgrades for each level. The Sport is a well-equipped base model, followed by the EX-L and the two higher grades – the Touring and Elite. Suspension is fully independent fore and aft and the electric power-assisted rack and pinion steering is quicker with a sportier feel and positive feedback. All models except the line-topping Elite may be configured with front-wheel drive or Honda’s available i-VTM4 torque-vectoring, all-wheel drive system and four-mode Intelligent Traction Management system, which enables the Passport to tackle rough terrain normally reserved for less refined body-on-frame or off-road focused SUVs. All Elite trim models come with iVTM4. The ITM modes are: Normal, Sand, Snow and Mud. 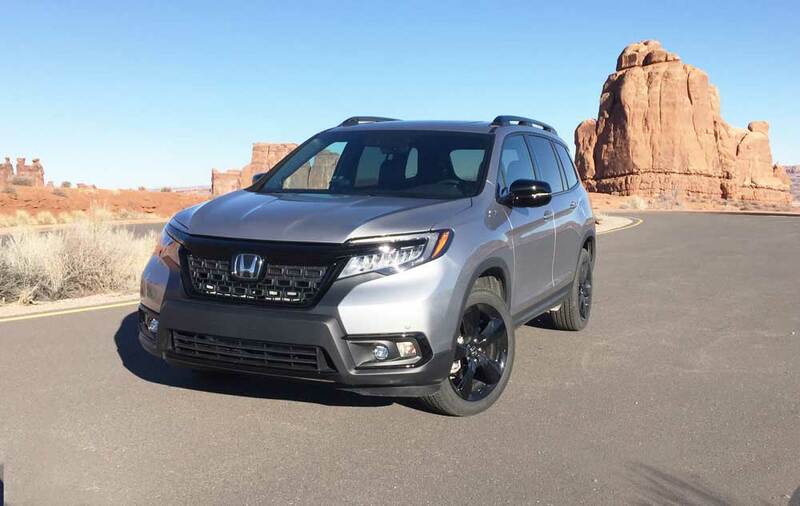 All trims will feature 20-inch alloy wheels and tires; the Honda Sensing® suite of advanced safety and driver-assistive technology; LED headlights; fog lights; taillights; DRLs; Smart Start and Smart Entry, and three-zone automatic climate control. EX-L and higher trims utilize Honda’s latest Display Audio interface with an 8-inch touchscreen, a physical volume knob and Apple CarPlay® and Android Auto™ integration. There are also multiple accessory options for personalization. 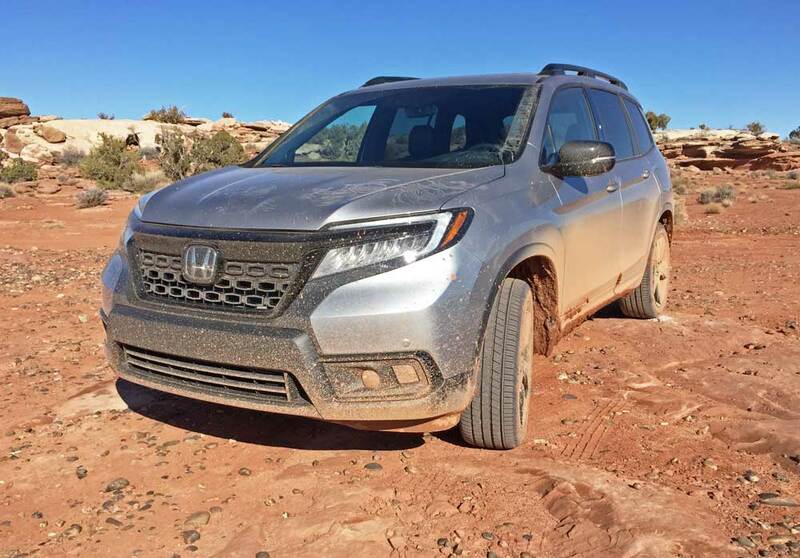 Propulsion for the 2019 Honda Passport comes from a transversely front mounted 3.5-liter, SOHC, 24-valve, direct injected iVTEC V-6 engine that puts out 280 horsepower at 6,000 rpm, along with 262 lb.-ft. of torque at 4,700 rpm with auto stop-start. Motive force is geared to the driving wheels via a nine-speed automatic transmission with shift-by-wire and paddle shifters. 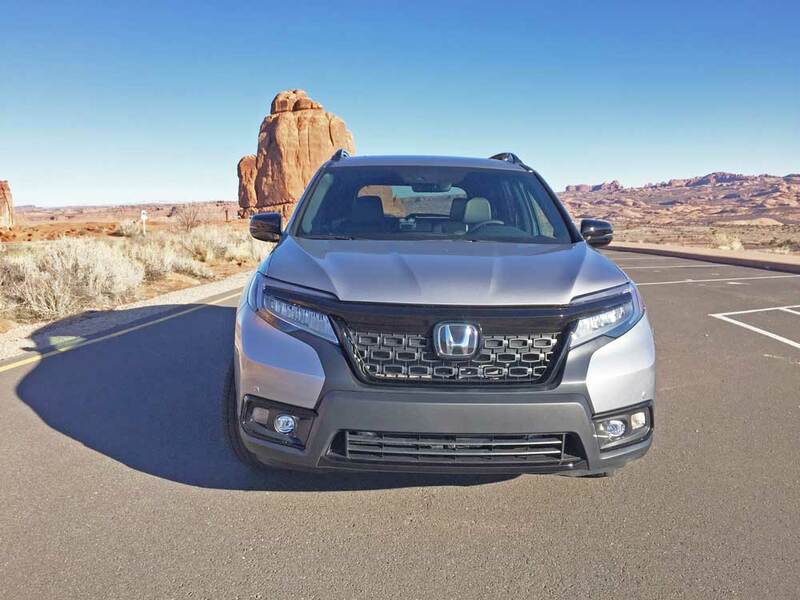 The styling exhibits a robust and ready for adventure persona, and the new Passport was designed and developed exclusively by Honda’s North America R&D teams in Torrance, California, and Raymond, Ohio. 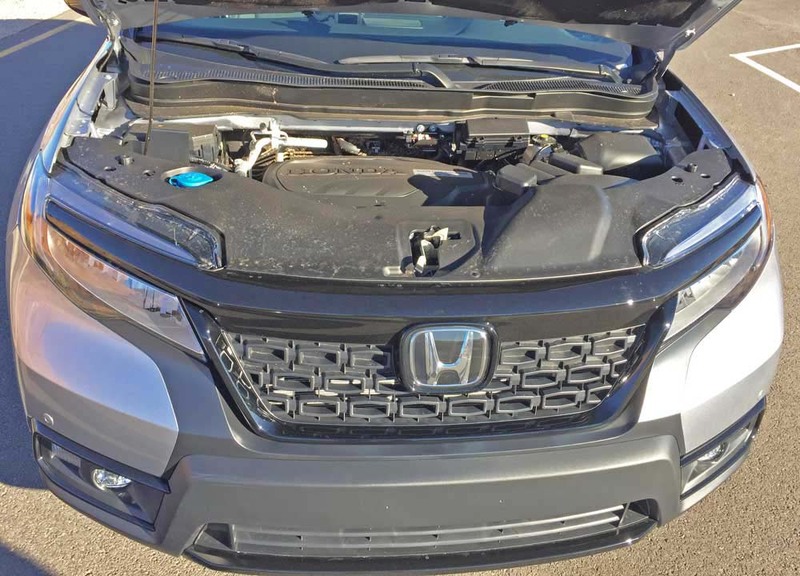 It is Honda’s most rugged light truck ever, and the expressive design is highlighted by its higher ride height, standard 20-inch wheels, 245/50R all-weather tires and sporty cues, including a matte black grille and bumper, blackout headlights and black wheels. LED headlight accents, gloss black trim, a “floating” C-pillar, and chrome exhaust finishers hint at Passport’s around-town sophistication. Trim-exclusive wheel designs are available across the lineup, and Touring and Elite trims offer upsized 265/45R20 tires as standard fare. Beyond its appealing good looks, Passport’s design offers enhanced functionality. Ground clearance is up 0.5 inches on front-wheel drive models and 1.1 inches on all-wheel drive models compared to Passport’s three-row sibling, Pilot, while its shorter overall length and shortened rear overhang offer improved approach, departure and break-over angles, suitable for more rugged terrain. Passport’s stance is athletic and sporty, supporting both responsive on road handling and increased grip off-road. The boldly styled front end stands out on the road with its scratch-resistant matte finish grill suited to off-road adventures. Passport’s interior design is modern and sophisticated, offering ample space for five people and their gear, providing a class-leading passenger volume of 115.9 cu.-ft. and best-in-class total interior volume of 157.1 cu.-ft. Passport features high-quality interior appointments including attractive and durable cloth on Sport or perforated leather on EX-L, Touring and Elite trims, a blackout headliner, and soft-touch surfaces on the dash and doors. The interior also provides class-leading utility. Behind the second row of seats is a generously sized cargo area. with 41.2 cu. ft. of space, expandable to 77.9 cu. ft. with the second row folded flat. 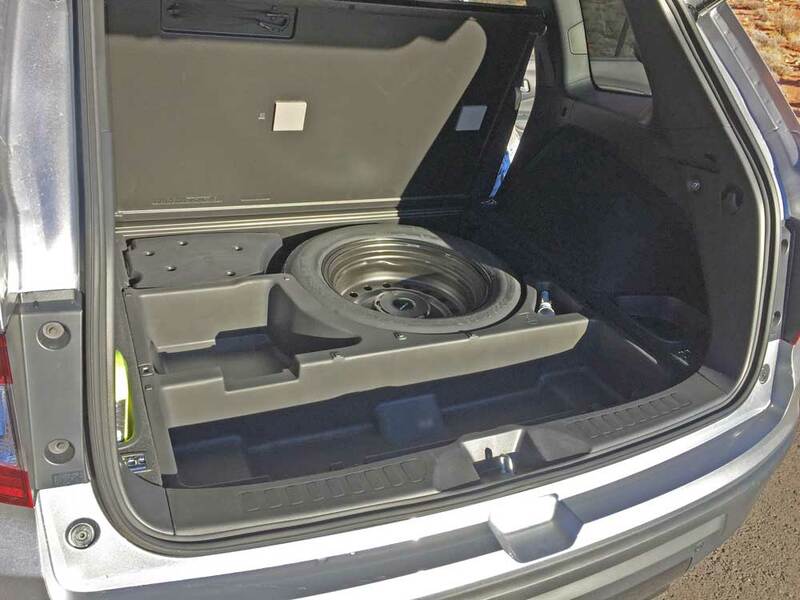 From the cargo area, the second-row seatbacks fold with the push of a button, and Passport’s main cargo floor is reversible between carpeted and easy-to-clean hard plastic surfaces. Passport features class-leading underfloor storage, with 2.5 cu. ft. of easily accessible compartmented storage, which can be accessorized with removable washable bins, including a custom bin for storing the available accessory trailer hitch receiver. 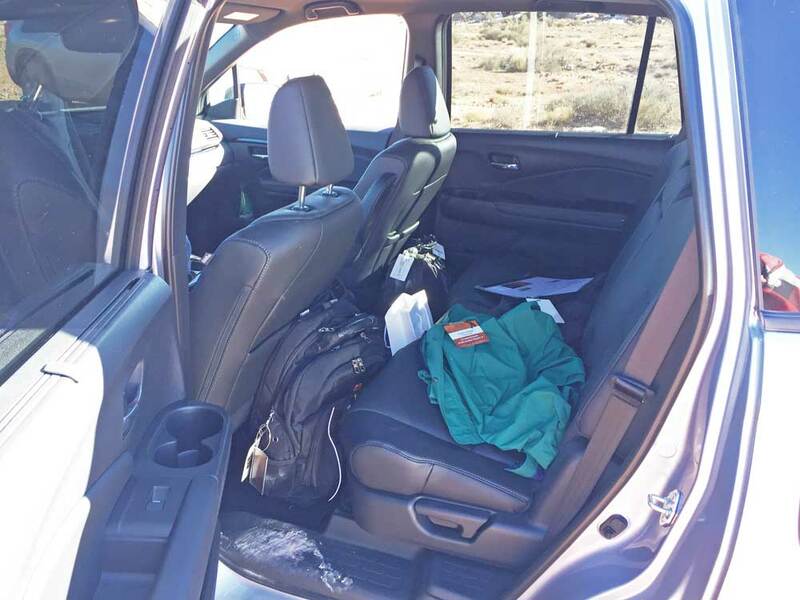 Passport offers generous storage space for front seat passengers, including a huge center console bin between the front seats with a rolling cover that serves as a tray when closed. 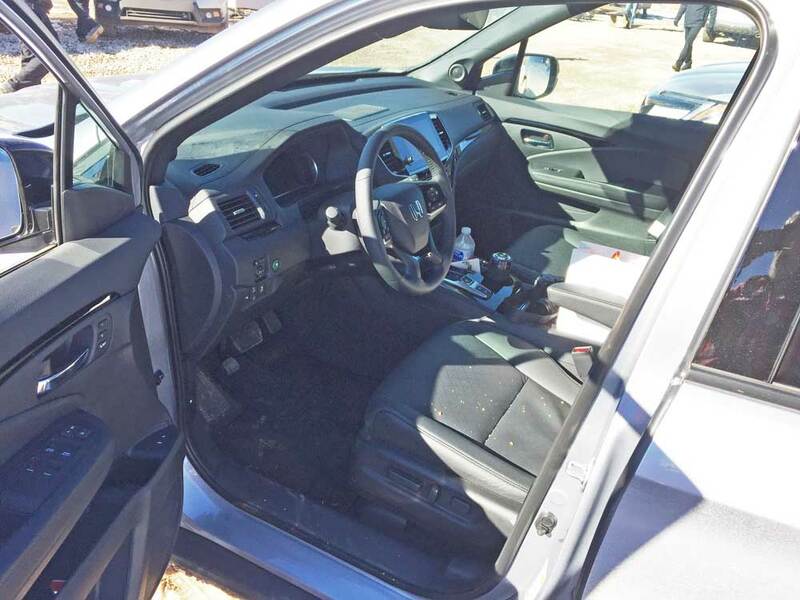 Additional storage is found in the doors and ahead of the push-button gear selector. 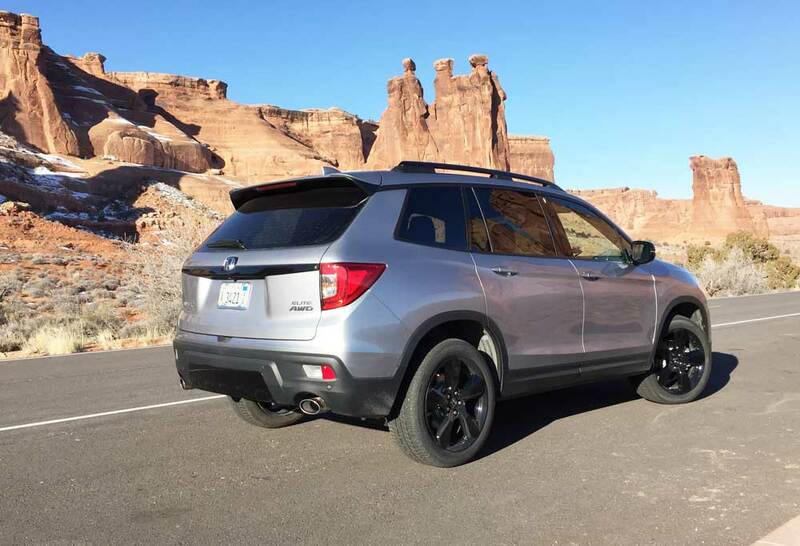 There are a wide range of Honda accessories for active lifestyles, including an Adventure and Urban accessory package as well as individual stand alone options. 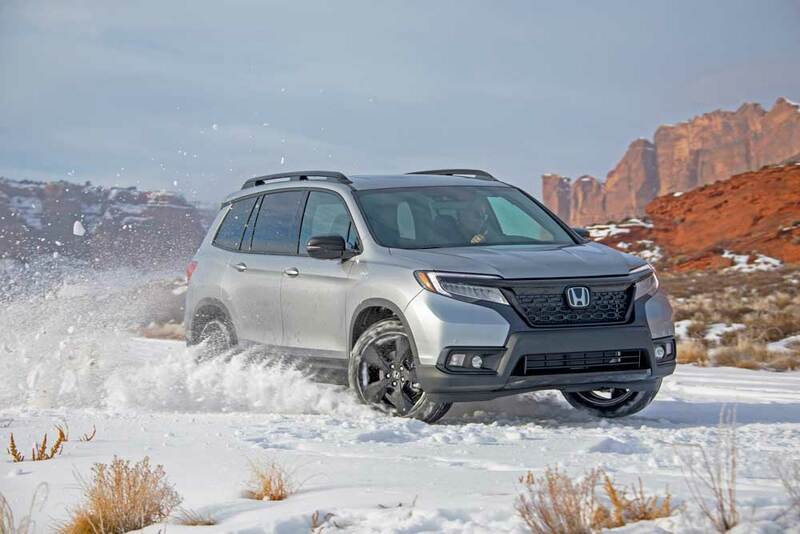 Passport has a 3,500-pound towing capacity for front-wheel drive models and a 5,000-pound capacity for all-wheel drive models when equipped with the optional towing package. The standard multi-view rear-view camera makes connecting to a trailer easy with its “overhead” option giving the driver a bird’s eye view of the hitch and trailer. Passport offers available amenities such as an audio and connectivity system with Apple CarPlay® and Android Auto™ integration and a digital driver’s meter. Passport’s Sport trim comes standard with a 215-watt audio system with a five-inch display monitor and six speakers, plus a subwoofer. 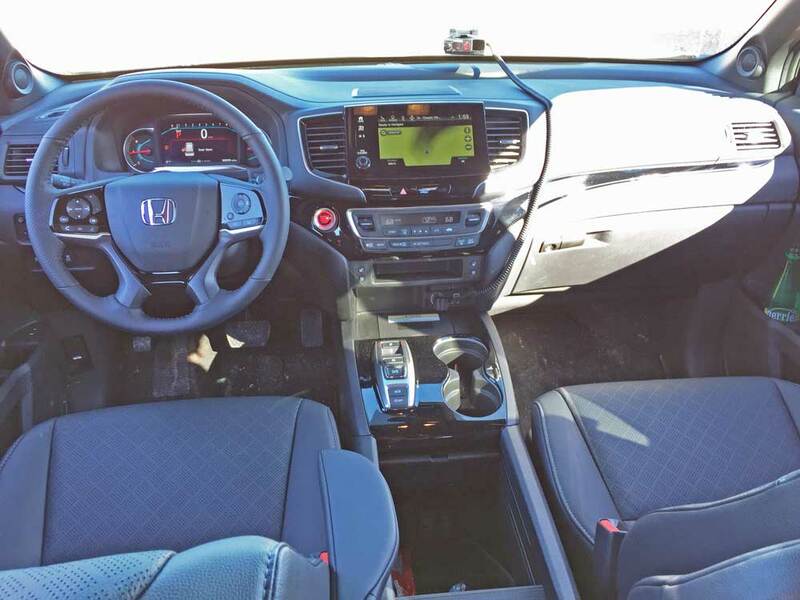 Passport EX-L, Touring and Elite trims feature Honda’s eight-inch Display Audio touchscreen system with Apple CarPlay® and Android Auto™ smartphone integration and manual power/volume knob. The Display Audio system uses gestures common to smartphones and tablets, such as swipe, tap and pinch, to control the vehicle’s audio system, display settings and other advanced features. Intuitive and easy to use, with a simplified menu structure, it also offers customizable shortcuts for commonly used features and customizable app locations. Passport Touring and Elite trims come with a 590-watt 10-speaker premium audio system. Passport’s instrument cluster uses a seven-inch Thin Film Transistor (TFT) screen with a wide range of information content. In addition to displaying typical vehicle functions such as vehicle speed and RPM, the full-color digital meter includes a Multi-Information Display with customizable features, such as audio system information, a detailed trip computer, phone information, and turn-by-turn route guidance on models equipped with navigation. Drivers navigate the new TFT using steering wheel controls designed for intuitive operation. Touring and Elite trims of Passport provide 4G LTE in-vehicle Wi-Fi TCU that can supporting up to seven devices and a free 90-day/3GB trial period AT&T data plan. The TCU is key to Passport’s support of numerous HondaLink® cloud-based services. Using an app, owners can keep track of maintenance and even book appointments, remember their Passport’s location and numerous other functions. 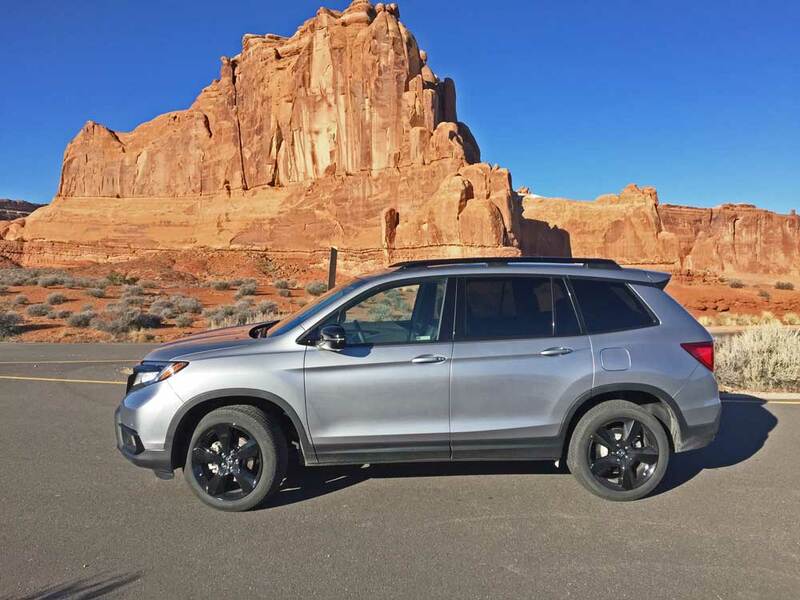 The Honda Sensing® suite of advanced safety and driver-assistive technologies is standard on all 2019 Passport trims and includes Collision Mitigation Braking System™ featuring Forward Collision Warning, Road Departure Mitigation including Lane Departure Warning, Lane Keeping Assistance System and Adaptive Cruise Control. The new Passport is focused on a high level of active and passive safety performance and targets an NCAP 5-Star Overall Vehicle Score safety rating and an IIHS Top Safety Pick rating. All tested 2019 model-year Honda vehicles achieve an NCAP 5-star Overall Vehicle Score safety rating. Additional available driver-assistive technologies include dynamic guidelines for the rearview camera, blind spot Information system (EX-L, Touring and Elite) with Rear Cross-Traffic Detection, and front and rear parking sensors (Touring and Elite). For the national press introduction, all journalists were issued Silver finished Passports in Elite trim. Some felt that the Passport was too similar to the larger Pilot, but despite similarities, the Passport is more compact, while still managing to deliver a spacious and versatile interior and admirable performance. The 3.5-liter V-6 is strong and responsive, and the ride quality is excellent, particularly on-road. Although it’s a light truck, it handles with the characteristics of a sedan. The Passport comes with an impressive inventory of safety technology, and its price is both reasonable and affordable considering the content level, making for a good value. The fuel economy is not overly impressive, but it’s adequate considering the overall mass. 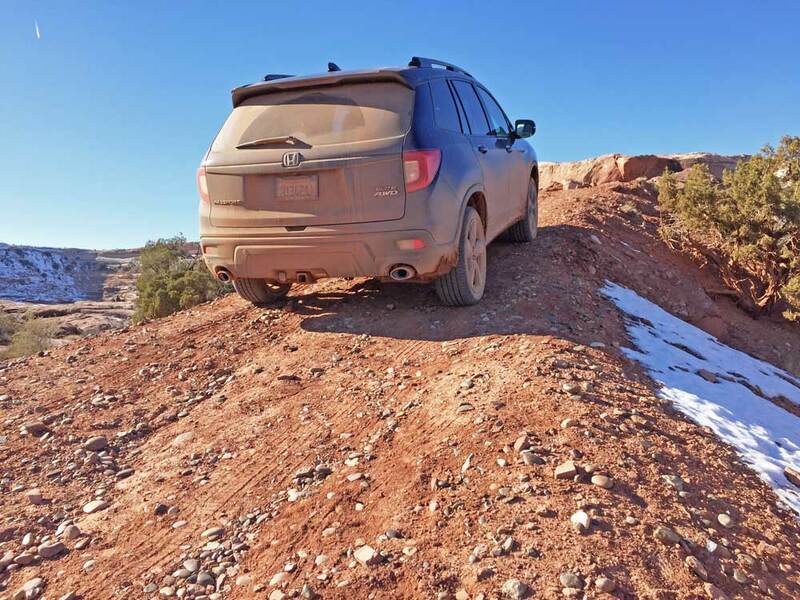 There was an equitable balance of both on-road driving along the Colorado River, and off-road driving scenarios, which included snow, mud, and sand. In the Arches National Park. There was even some modest rock crawling. The Passport delivered satisfying and even surprising results in all venues. 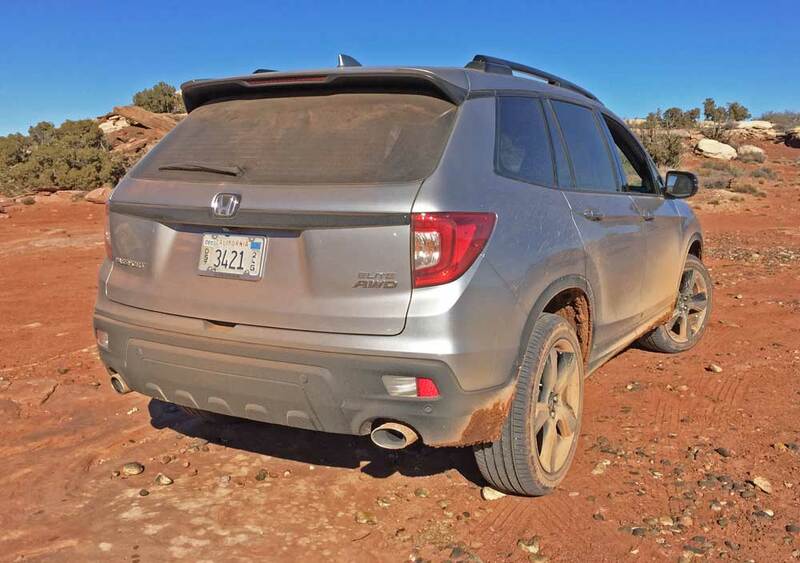 It is actually surprising in terms of its off-road capability. 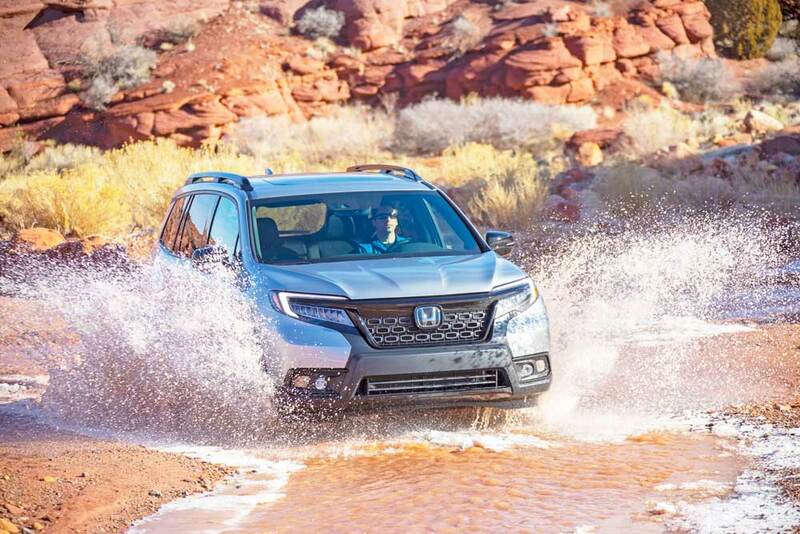 In a bottom line analysis, the 2019 Honda Passport in Elite trim represents an ideal SUV, especially for those who don’t want or require third row seating. 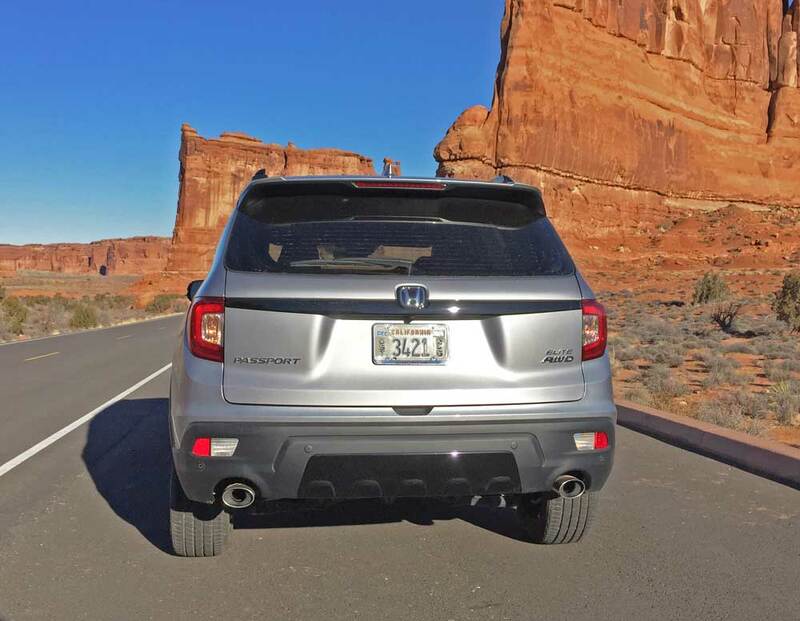 If the Passport moniker sounds familiar, Honda used to market a rebadged Isuzu Rodeo as the Passport during the early initial SUV movement. 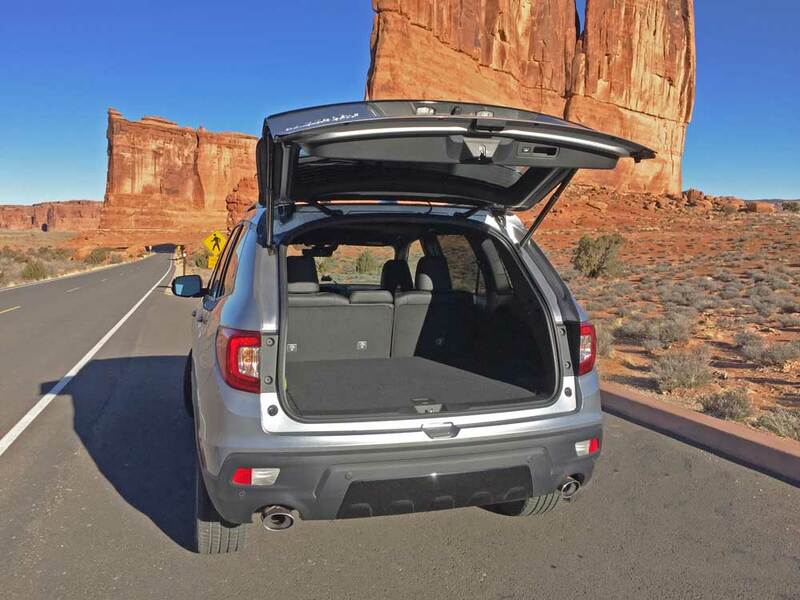 Most trims feature a power tailgate that opens to reveal 41 cubic feet of storage space with the rear seat up and nearly 78 cubic feet with the second row folded flat. The mid-price range Passport EX-L will likely be the volume sales leader. Transmission: Nine-speed automatic with shift-by-wire and paddle shifters. 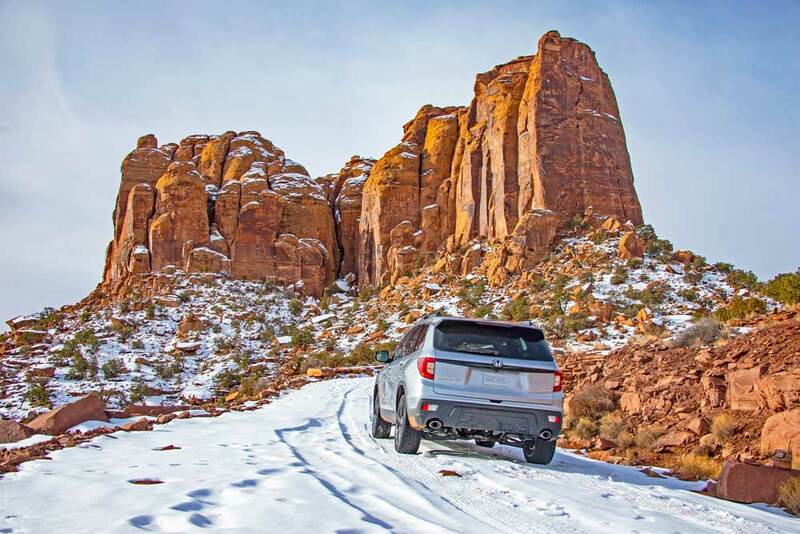 Drive Train: Transversely mounted front engine / AWD Intelligent Variable Torque Management™ (i-VM4™) with Intelligent Traction Management with Normal, Sand, Snow and Mud modes. Brakes: Power-assisted four-wheel discs (vented front) with ABS, VSA with Traction control, EBD, TPMS and BA. 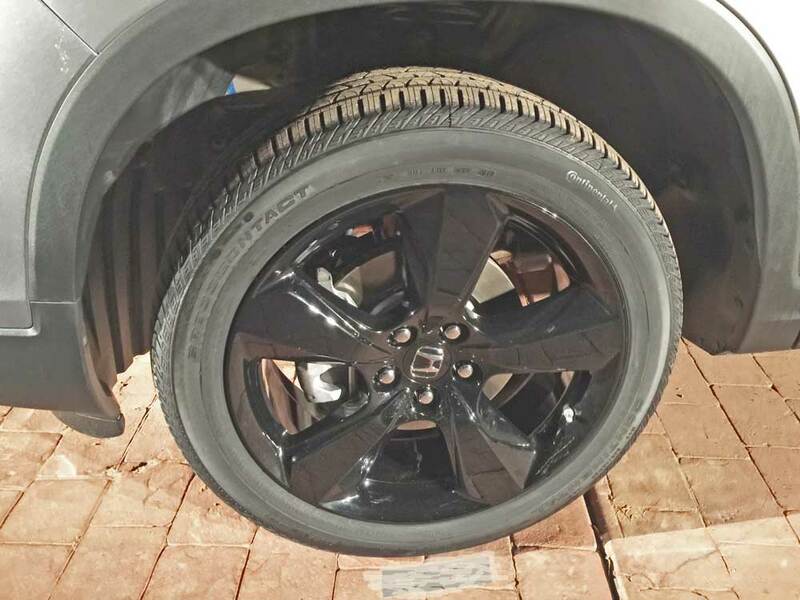 Tires: Continental Cross 265/45 R20 mounted on 5-spoke Black 20” alloy wheels.